Wearing swim paddles during training is an excellent way to improve stroke technique, build muscle strength and increase swimming speed. The best swim paddles can help a swimmer learn correct hand positioning, learn to incorporate the entire arm into the stroke, gain a better feel for the water, increase distance per stroke, and improve pulling technique and efficiency. Paddles also spice up training and help ingrain good habits. For paddles to be of help, it is very important to wear the right pair and use them correctly. To help you choose the right pair, we have reviewed ten best hand paddles for swimming and have a buying guide with choosing tips. To help get the most out of a pair, we also cover the benefits and downsides of using hand flippers and how to care for them so they last longer. 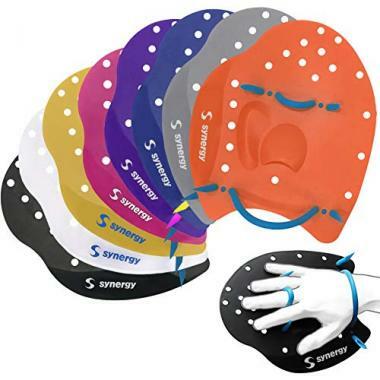 The broad-blade design makes these top rated swimming hand paddles by Synergy very effective at building shoulder and upper body strength and power. This is because the large surface area adds just the right amount of resistance. These paddles can even work great in maneuvering a fishing float tube or kayak. They also emphasize a swimmer's natural feel for the water, which helps with stroke mechanics. Holes allow water to channel through so every stroke is smooth and controlled. Available in a small, medium and large size, they work for swimmers of all skill levels and desired levels of resistance. Since the wrist and finger straps are adjustable, their fit is great. The ergonomic shape that mimics a large hand ensures your hands stay in place during a stroke. The material is good quality and this is a sturdy and long lasting pair. FINIS swim paddles are unique and innovative. 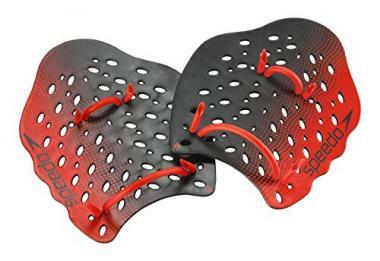 Their Agility hand paddles are designed to correct form, increase stroke efficiency, build upper body strength, and promote a proper catch position. The convex design encourages an early catch, helps develop the correct palm positive hand position, and reminds the swimmer to maintain an early vertical forearm position. The strapless design forces good entry, catch and stroke technique. Incorrect entry causes the paddle to slip off offering instant feedback. That the paddles sink if also encourages proper technique to keep them from falling and sinking to the bottom. The ergonomic shape fits the natural contour of the hand while the thumb opening leads to proper hand placement. True to their name, these swim training paddles are truly agile. 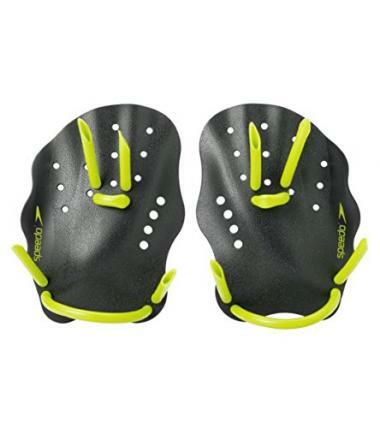 They are easy to slip on and off during interval workouts or if you need to use your fingers to manipulate a waterproof device or adjust your swimming goggles or swim cap. The Agility Paddles work for all four swim strokes - freestyle, backstroke, breaststroke, and butterfly, fit most hand sizes and are durable. They are a solid investment. If resistance is what you are looking for, the Speedo Nemesis contour swim paddle provides a lot of it. The design with tubercles along the edges is inspired by the Humpback whale fin. It increases surface area along the paddle's edge providing increased resistance to build strength. If you swim to reap the swimming health benefits of a cardio workout, this increased resistance will work your upper body harder. The scalloped edges also increase the amount of water you pull with each stroke, improving pull mechanics. 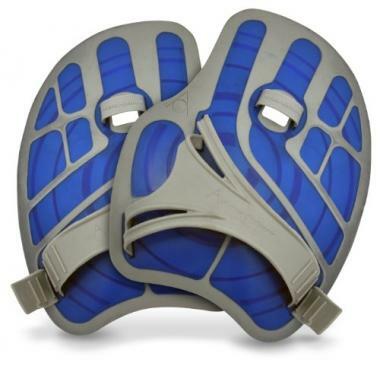 Their contoured design helps keep the hands in the correct position for water entry, which can prevent shoulder pain. Your hand conforms to the paddle shape and you slip your wrist, fingers, and thumb through the tubing. There are no issues in the fit or in keeping them on while swimming, but they are simple to put on and take off. Speedo, the world's leading swimwear brand, offers great active swimsuits and swimming accessories to increase performance. When it comes to swimming paddles, they have options to increase strength, perfect hand position, and engage in resistance drills. The Speedo Power Plus are such well-designed swim hand paddles. They are even swim coach approved. The multiple holes allow water to pass through for better feel and control and also provide multiple strapping options for optimal fit and performance. The scalloped edges help push more water for a smooth pulling trajectory. With four size options, this is a versatile paddle suitable for all resistance abilities, drill work, and strokes. The X-large size gives a great upper body and shoulder strengthening workout. The tube straps offer a comfortable and secure fit. The paddles remain snugly in place and glide into the water nicely. The material is textured EVA foam. Designed by Nancy Schlueter and based on the original design by Walt Schlueter, both swimming coaches well known for their stroke technique training, this is definitely one of the best swim paddles. 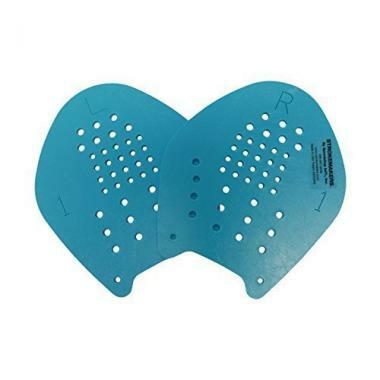 Whether you're a synchronized swimmer, do water aerobics, rehabilitation exercises, competitive strokes for drills, pull sets, stroke work, or sprint-assisted training, this pair of swimming hand paddles will serve you well. They're designed to improve stroke technique and strengthen swim-specific muscles while reducing stress on the shoulders. They prevent early recovery thus increasing distance per stroke. The holes allow water to pass through, which improves feel for the water. These paddles also offer feel by exaggerating both correct and incorrect hand motions. The Strokemaker comes in seven sizes and is suitable for both kids and adults. The shape ensures the hand remains open and relaxed while improved wrist and finger tubing ensure a snug fit. Made in the USA, these are long-lasting paddles. Their swim paddle reviews by swimmers attest that they last for years in good condition. These are top rated swimming hand paddles with many user comments like 'love them! ', 'fantastic swim training tool! ', among others. If you want to improve your form and stroke, these paddles are perfect. The contoured design helps you naturally assume the optimal hand positioning and swim form during all phases of the stroke. With the many small perforations and water channels, these paddles offer just the right amount of resistance to build strength and train for an extended duration without experiencing shoulder issues. The openings also allow a better feel of the water. These Start Smart contoured hand paddles are also the most ergonomic. 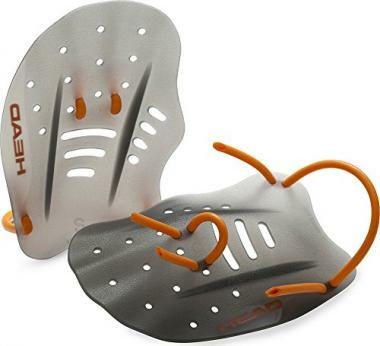 They provide a lot of comfort during training and prevent shoulder strain. They are designed to fit everyone from juniors to adults, men to women, beginners to experienced swimmers. All the fingers and the back of the hand are held by the flat and adjustable rubber band. The center strap for the middle finger is also very comfortable. They are also very durable and provide long-lasting service. Do you want to improve your stroke technique or correct form when freestyle swimming? 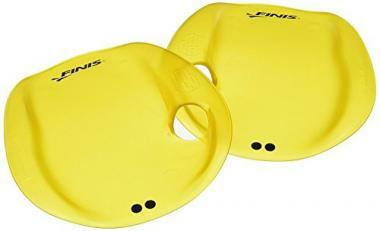 These FINIS Freestyle swim paddles are designed specifically for that and are the best swimming hand paddles for you. Their swim paddle reviews by freestyle swimmers show that they deliver results fast and they don't cause the dreaded 'swimmers shoulder'. The upbeat FINIS yellow will also brighten up your training. The long and narrow fin/surfboard shape of these hand flippers decreases resistance through the water and planes the hand forward, increasing distance per stroke while minimizing strain on the shoulders. The unique skeg design encourages correct hand entry and provides instant stroke feedback. If your hands don't enter the water correctly, the paddles will try to come off letting you know you've made a mistake. 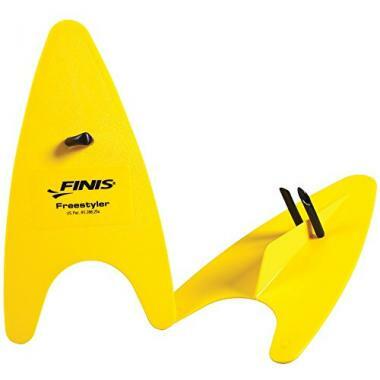 Overall, the design of these FINIS swim paddles promotes a strong pull through and better hip-rotation and increases efficiency and freestyle swimming speed. What makes these Aqua Sphere ErgoFlex paddles among the best swim paddles is their optimal design and rubber construction. They are large in size and have no holes so they provide good resistance forcing the upper body to work harder and building muscle strength. If you own a kayak, you can even carry them as a backup in case your kayak paddle fails. The contoured shape fits your hand’s natural curve, mimics proper hand positioning and can flex to fit individual stroke mechanics. Rubber frame is safe to use when swimming with others, offers some degree of flexibility for comfort and enhances feel for the water. With the contoured design and adjustable wrist strap, the paddles stay on well. They are well made to last and the straps are tough. The Speedo I.M. Tech multi-stroke paddles are designed to improve stroke technique for butterfly, backstroke, breaststroke, or freestyle swimming. They benefit the catch, pull and feel. The pronounced edges promote better feel for the catch phase of each stroke. The multiple holes offer feel of the water. You can interchange the paddles between right and left hands depending on the stroke technique you're working on. 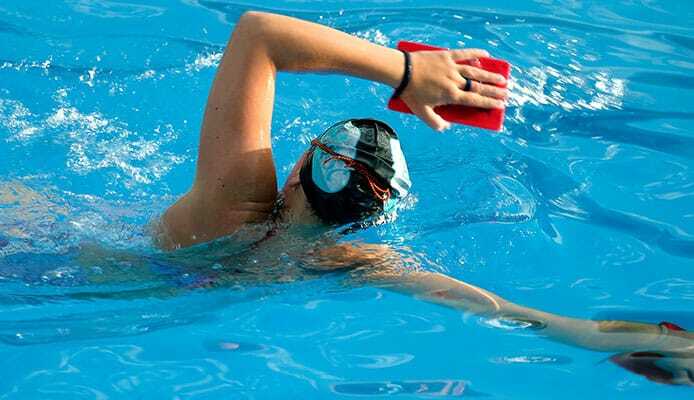 These swim training paddles also help build arm strength and endurance, develop proper form, improve arm rotation and increase swimming speed. The use of hard and soft materials in their construction enhances performance. The tubing straps secure them to your hand and they stay in place without loosening up. They are also well made to hold up well making them a solid investment. This contour swim paddle was made to help swimmers improve their stroke technique and power. The hydrodynamic design promotes technique development. When swimming with these paddles on, you will experience increased propulsion and an appropriate level of resistance that will work your upper body muscles. The openings allow water to pass through and offer a feel of the water. The contoured shape mimics the path of a pull without paddles, as the palm and fingers acquire a natural position. The plastic construction is good quality and durable and the silicone straps are adjustable. Swim paddles vary depending on the purpose they are designed to serve. Some are meant to improve technique while some are aimed at helping elite swimmers win gold medals. Some are designed for a specific stroke while some are multi-stroke training tools that work for all four swim strokes freestyle, backstroke, breaststroke, and butterfly. Understanding what a pair is designed to accomplish is extremely important before you make your order. This way, you can pick a pair that will actually improve your technique and performance while avoiding injuries and bad habits. Larger and wider hand paddles give more resistance and make your body work harder. They are great for building upper body strength. Adding a pull buoy will position your body better and control leg kicks to make your upper body work even harder. Want to improve your catch and feel of your stroke in the water? You can go for fingertip paddles. For swimming hand paddles to help you improve technique and develop power, they should fit properly. To achieve a great fit, order the right size for your hands by consulting the size chart. Adjustable paddles will offer a superior fit since you can achieve a custom fit. For the best fit and training effectiveness, the paddle should be 10% larger than your hand. You should be able to keep a natural finger position where the palm is open and the fingers are open a little bit with them on. The fingers shouldn’t extend out of the paddle edges. There should be a 1cm gap between the fingers and the edges to create an even distribution of the pressure applied by the palm, forearm, arm, and shoulder on the paddles. With the right fit, you won’t feel the need to spread your fingers wide in order to apply pressure on the paddles more evenly. You also won’t find your fingertips curling around the edges of the paddles to gain stability. Hand paddles for swimming come in small, medium and large sizes. The important thing to keep in mind as you make your order is that these sizes are meant for different levels of training. Not hand size. What size to choose will depend on your strength and the level of resistance your shoulders can handle. Never used swim paddles before? The best swim paddles for beginners are fingertip paddles or smaller hand paddles just slightly bigger than your hands. Once you become slightly more advanced and get stronger, you can switch to the medium size then graduate to the large size so as to experience more resistance and have to pull harder thereby building strength and power. For an open water swim, you will need larger paddles that will be able to withstand the strong currents. The wrong size of paddles can cause serious injury and harm. If the paddles are too big, there will be too much resistance. You will exert a lot of effort for every pull and this will mean shoulder trouble later. You will also have to spread your fingers too much or unnaturally to apply pressure evenly and this will lead to strained ligaments and tendons. Paddles smaller than your hands are also not good. You will find yourself grabbing the edges for stability, which will create a lot of tension on your wrist and make it inflamed. When swimming with hand paddles on, it is important to keep the palm of your hand open and flat and fingers spread apart in a natural position. Contoured hand paddles mimic our hand’s size, shape, and form and encourage this proper hand position. 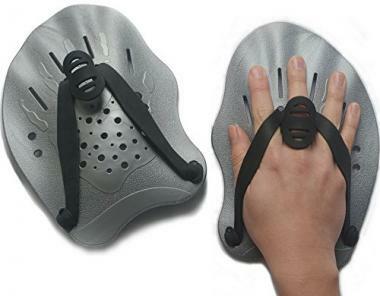 When wearing them, your hand conforms to the paddle shape and falls into a natural position for swimming. The contours also make them ergonomic and comfortable to wear for extended durations. The best hand paddles for swimming are sturdy and made using quality materials. They are also lightweight and comfortable to swim with. Traditional swim paddles meant for power and strength development are made out of plastic. A rubber construction offers some degree of flexibility in the water and is safe to wear when training with other swimmers. The straps should be made using a strong and flexible material to avoid the hassle of broken straps when swimming. Q: What Are The Benefits of Swim Paddles? Strapping on a pair of swim paddles takes your hands out of the way so you are able to develop a better feel for the water, position your hands correctly and engage your entire arm in the stroke. This improves the efficiency of the catch and pull. Hand paddles without straps improve your hand entry. If you go for an early vertical forearm, the paddle will slip off letting you know that your hand positioning needs correction. When you swim with hand paddles on, your stroke lengthens because you reach further with your leading arm and are able to pull more water to propel you forward. Your pull will become more efficient, you’ll notice an increased distance-per-stroke and you’ll swim faster. You will get a feel for how your form is like when you are most efficient in the water and you will get used to swimming at great speed. Swimming with paddles is a swim-specific strength-training workout. The increased surface area due to the paddles offers increased resistance, which forces the muscles in the back, chest, arms, and shoulders that power a swim stroke to work harder. This builds upper body strength so a swimmer is able to generate a powerful pull for high-speed swimming. Swim hand paddles can also spice up your workout. Bored by monotonous repeats of the same workouts? Throwing in some paddles will present a new challenge that will make training exciting and fun again. These training tools will also add efficiency to your workouts helping you make the most of your training time. A waterproof MP3 player and swimming headphones will also make your workouts much more pleasant. If you want to find out how using hand paddles is helping you, here are ways to track your swim workout. Q: What Are The Downfall Of Using A Swim Paddle? A: While a swim paddle is a very beneficial training accessory, there are downfalls to its use as well. If used incorrectly or excessively, it can lead to bad habits and/or injuries. An oversized pair can encourage spreading of fingers, which will strain arm ligaments and tendons causing inflammation. If you have weak shoulders or swimming shoulder injuries, swimming with paddles can aggravate the issue. Paddles can also encourage bad training habits such as a gallopy stroke. And if a swimmer has technical issues such as dropped elbows or a lack of feel for the catch, paddles won’t be of benefit until the swimmer corrects these issues. Too much of a good thing can be harmful and this is also true with swim paddles. Only use paddles for a quarter of your workout. Incorrect use or overuse can exert too much stress on the body, leading to incorrect muscle usage and swimmers shoulder. Q: How To Care For Swim Paddles So They Last Longer? A: Swim paddles are low maintenance. They don’t need pampering but a little extra care will go a long way. To keep them in good condition and ensure they last long, rinse them after use and pack them in your swim bag carefully. Whether you want to correct your form, develop strength and power, get used to swimming incredibly fast, or are training for a race, swim paddles can help you achieve your goal. Just like using swim fins helps strengthen the lower body, proper use of hand paddles – also referred to as hand flippers or swimming hand fins – can strengthen the upper body, improve feel, and strengthen the stroke and pulling technique. Smart use of swim paddles is by improving technique first then working on building strength. This way, you learn to do it right then learn do it powerfully. When swimming with paddles on, focus on the feel of the water and concentrate on how your body is moving so you will be able to achieve the same performance sans hand paddles. How about you? Which swimming hand paddles is your personal favorite, even if it isn’t included in our swim paddle reviews? Let us know your thoughts and experiences in the comment box below!